From the Columbian Exchange beginning in 1492, the development of slavery as a Southern institution, and the westward movement to the dust bowl, the Endangered Species Act, and the destruction caused by the BP oil spill in the Gulf of Mexico, human interaction with the environment in America has been continuous, open-ended, and dynamic. How communities and individuals have used land, water, and natural resources has profoundly shaped U.S. history, influencing settlement patterns, social relations, cultural life, economic systems, and political institutions. In the past generation, scholars have examined these human-environmental interactions in myriad ways, giving birth to the exciting, new field of environmental history. By shedding light on new issues and recasting familiar views of major events and developments in our nation's past, environmental historians have reinterpreted American history in a way that is gripping, immediate, and timely. 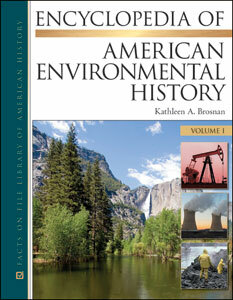 The essential reference to this critical topic and the only work of its kind, the four-volume Encyclopedia of American Environmental History begins with eight broad thematic essays, which highlight the major issues and topics in environmental history and serve as an entryway to other, more specific articles throughout the reference. Arranged alphabetically, more than 750 articles cover every significant issue, event, law, and figure in U.S. environmental history. All articles are written and signed by leading environmental historians, scholars, and experts, many of them members of the American Society for Environmental History (ASEH). The Board of Advisers is composed of a wide array of distinguished historians, and many of them are ASEH founders and members. Useful reference features include 200 illustrations, 100 original documents, 80 maps, 20 charts, a master chronology, bibliography, and an index.